The whole event was great,but did you hear that a small dog was killed by a bigger one ? That is so horrible ! The pictures are lovely. I was there as well at the pet show yesterday but could'nt get any nice shots. Yes it was true Diana. We were there when the sad and shocking inccident happened. It was a toy poddle died. It was killed by a brazillian fighting dog. I just hope that in the next event, organizers should not allow any dogs which are "banned" from this country. And how the place on earth those breeds enter the country? They should not be here in the first place are they are illegal in the UAE. It is not a joke having a pet here in the UAE. There are some rules and regulations to acquire a pet. It is not as easy as 1,2,3! 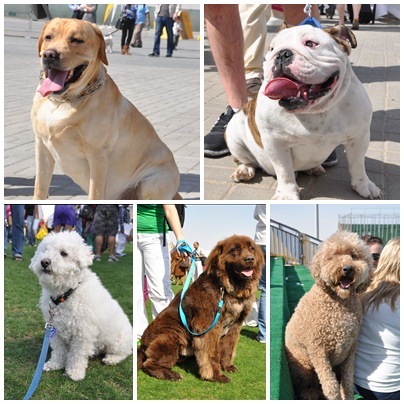 i was at the pet show.....see not all the big breeds(or illegal breeds in uae as people says) are dangerous....it was an unfortunate incident....and i think the staffordshire should not be put down.....now we cant afford to loose another pet.......we humans should understand that mistakes are done by humans as well as dogs.. I totally agree with anonymous, having a pet is a huge responsibility it isnt a joke, especially if you are bringing a big dog to an event were young children are going to be too.This time it is a toy poodle , next time it might be a baby ! Someone might trust and love their dog alot, but most dogs are loyal only to their owners. It was really irresponsible to put everyone in sucha risk.Dogs are dogs, you'll never know whats on their minds..